FirstWord spoke with Richie Etwaru, the chief digital officer of QuintilesIMS, about the need for orchestration – or coordination - within the pharmaceutical industry's customer engagement model. Customer engagement can be hindered by operational silos and lack of collaboration between departments, limiting a pharmaceutical company's growth and even draining the bottom line.1 However, transforming an organisational culture with vertical silos so that it is more horizontally aware is not an easy task with the rise of empowered consumerism and informed customers who know exactly what they want and how they want to be engaged with. Due to the complexity of customer needs and messages that must be synchronised via multiple channels, coordination - or orchestration - is needed between departments in efforts to present each customer segment with a unified message that is relevant, contextual and well timed. Etwaru described the moment he realised the critical need to orchestrate silos to deepen customer engagement: "when I looked at the problem, I saw a disease I call 'multiplicity.' The sales representative, marketing teams, events management, medical affairs and the home office call centre all have multiple methods of engaging a single doctor," he said, adding "it looked like a series of instruments played by a bunch of kids in a garage, all making tons of noise from different but similar song books, and while there was music playing, it was hard to hear the song. It needed to be more orchestrated." It is Etwaru's view that orchestration is critical to engender trust and build rapport with different stakeholders, including healthcare providers such as physicians, pharmacists and the insurers, who are intermediaries to the patients. "When you have to influence multiple stakeholders at the same time, from multiple departments in your organisation, you start to get inconsistency in messages," Etwaru explained. "Every time you have variation in messaging, your trust falls. We need orchestration to stitch all that together so that trust can be built with simple messages that are consistent, timely, and meaningful. "3 In other words, by not bombarding a single customer with multiple repeat messages, customers are more likely to perceive that the company truly cares about their needs, rather than simply wanting to sell a product (Figure 1). To promote effective orchestration between vertical silos, a key element is robust data management and building an integrated industry-specific tool, in contrast to the awkward amalgam of digital and analogue formats frequently seen today. With the current ill-fitting blend of digital and analogue systems, pharmaceutical companies are likely to observe a mismatch between information formats. "We need to stop 'CRM'ing' customers," said Etwaru in relation to the traditional customer relationship management (CRM) tools many companies use, adding, "today, most digital marketing systems can detect when an email that was sent to a customer is read, but very few attempt to share the data with other stakeholders who may interact with that customer, such as a sales representative. And for the very few that attempt to share this 'digital data point,' it is done in batches, sometimes a week later and many times after a month has passed." The ultimate goal of full orchestration is to improve operational efficiency and long-term commercial success by effectively engaging with key stakeholders. With orchestration, silos will not merge but rather converge; the barriers to communication between various customer-facing functions will be removed and the distances between the departments will be reduced, leading to greater operational efficiency, lower costs, and faster time to market for new therapies. Here, orchestrated customer engagement plays a key role in what is of most important to all stakeholders - patient outcomes. The horizontal alignment of vertical departments also enables the company to maintain a single, consistent view of the customer and broadcast a unified message that is crucial to establishing trust, building brand loyalty, and deepening customer engagement – ultimately, boosting return on investment. 1 Smith, J. 2013. 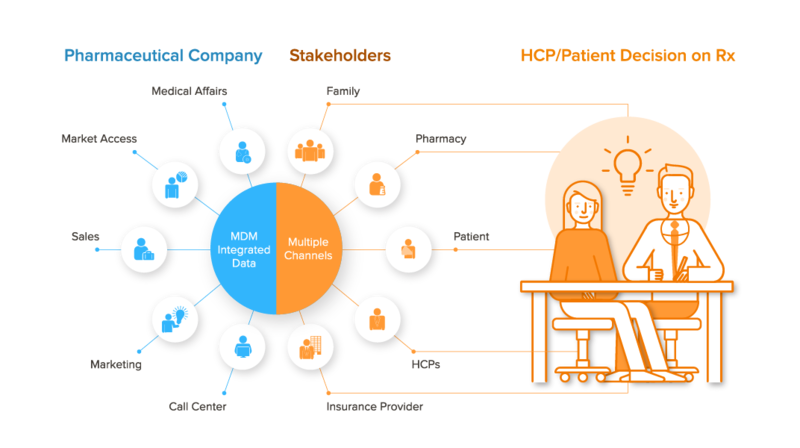 Overcoming operational silos in pharma revenue management [Online]. Available: http://pharmaceuticalcommerce.com/business-and-finance/overcoming-operational-silos-in-pharma-revenue-management/ [Accessed 27 June 2017]. 2 QuintilesIMS. 2017. Why is there a need for orchestrated customer engagement in the life sciences industry? [Online]. Available: https://www.youtube.com/watch?v=ElJEkFl_cOg&list=PLbAr7MAaEbwPBpBCrOhmAmipZf9NfDtWE&index=3 [Accessed 30 June 2017]. 3 QuintilesIMS. 2017a. Why is the "trust factor," which orchestration promotes, so important? [Online]. Available: https://www.youtube.com/watch?v=T8QpvdEYe5c [Accessed 30 June 2017]. 4 QuintilesIMS. 2016. Orchestrated Customer Engagement: Build customer trust and loyalty through more effective engagement [Online]. Available: https://www.quintilesims.com/-/media/quintilesims/pdfs/orchestrated-customer-engagement-build-trust.pdf [Accessed 28 June 2017]. 5 QuintilesIMS. 2016. How does a company go about implementing orchestration? [Online]. Available: https://www.youtube.com/watch?v=GvHyUCB408E [Accessed 27 June 2017]. To read more Sponsored Story articles, click here.